Patients want to see results. In some instances, when stem cells are used to treat orthopedic problems, if the procedures are done correctly, you can show patients amazing changes on an MRI taken after the procedure. In other circumstances, little changes are seen. Given that we were the first clinic on earth to do many of these procedures, we have had 12+ years to collect before and after MRIs. The video above goes over a sampler of MRIs in various regions of the body and orthopedic problems. Right now, there are about a thousand clinics that have begun offering stem cell therapies to treat orthopedic conditions in the last 24 months. While some of them are trying hard to keep it honest and do a good job, many have thrown caution and science to the wind and are making all sorts of crazy claims. For example, we have chiropractic offices that are advertising heavily, claiming that they can regrow brand-new knees from joints with severe arthritis. Most of them are injecting dead amniotic or cord blood tissue and claiming that this is a live “stem cell” treatment. Is this reality? Nope. It’s high-pressure sales. If you have “bone on bone” arthritis or a degenerated and collapsed low-back disc, there is no stem cell treatment available that will regrow you a new joint or disc. If this doesn’t happen, how do these procedures work in those type of patients? They likely work by changing the cellular and inflammatory chemicals within the joint, converting it from a cartilage breakdown to a maintenance environment. So what can be seen on MRI? In the video above you’ll see many different MRIs, mostly of knees and one ankle. What’s being shown is that joints with small holes in the cartilage can regenerate using the right stem cell technology applied in the right way. Or better stated, we have MRI evidence that seems to show regeneration and these patients improved consistent with that outcome. Was the cartilage or fibrocartilage growth? Given that we can’t biopsy these sites in real humans, there is no way to tell. Looking at studies in animals, it’s likely somewhere in between the two. What is real here? If you meet a doctor who claims that he or she can regrow a severely degenerated and collapsed disc, run the other direction. This is not possible in 2017. However, what is real? As you can see in the video, if you have a tear in a low-back disc causing pain or a bulging or herniated disc, we can see very significant changes in low-back disc MRIs after the procedure that can correlate with great results. However, your doctor needs to know how to perform fluoroscopy-guided procedures and needs to place the right type of cells in the right spot. 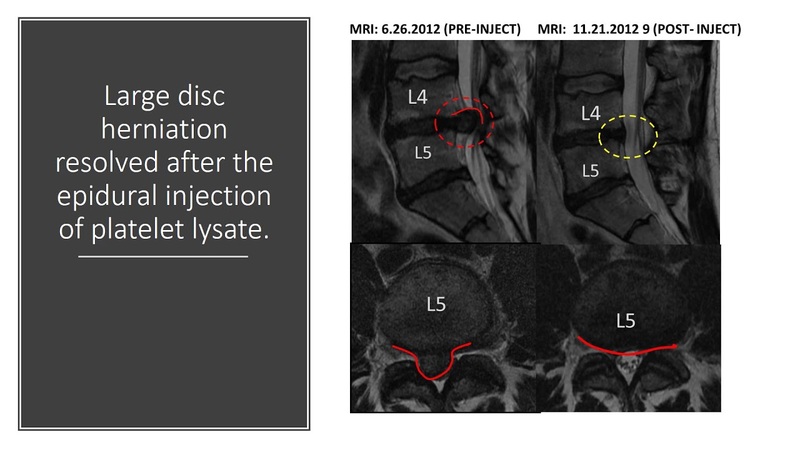 As an example, for the MRI changes shown, we used everything from a same-day bone marrow stem cell procedure to a specially cultured stem cell injection to an advanced platelet lysate injected via epidural. What can be done with torn ACL ligaments? The first thing to understand is that only about 70% of all ACL tear patients who are offered surgery are stem cell injection candidates. Deciding who is a candidate and who is likely to fail is an analysis only performed by Regenexx physicians. Why? We invented this stem cell procedure and only our network of physicians has a tool that can provide candidacy information. The other thing to comprehend is that these procedures must be done under fluoroscopy to precisely inject the origin and insertion of both bundles of the ligament. Only about 100 US physicians at this point can accurately perform this procedure, so buyer beware. As one example, ultrasound-guided injections for an ACL injury are likely not going to get enough cells to the right spot. In the video, you’ll see a few before and after ACL images. The brighter- and bigger-looking ligaments (usually outlined by the triangles) are torn, either with or without sections that have white through the ligament (a complete and retracted tear). The after images have denser and darker ligaments that are more normal appearing. These patients also all functionally recovered without issues without having any surgery. How about rotator cuff tears? What’s possible? Again, only about 70% of all tears can be treated with only a stem cell injection. Basically, this means tears that are 1 cm separated or less. For this procedure (different from the ACL injection above), you need to have stem cells precisely injected into the tear area using ultrasound guidance. In addition, while more providers can pull this off, we’re now talking about only a few hundred providers in the U.S. who are highly competent in this procedure. So what do the images show? Notice that there are brighter gaps in some of these supraspinatus tendons that heal. Sometimes these are bigger and sometimes smaller, but in all of them, there is evidence of healing without surgery. These are a smattering of cases from AVN/ON (a disease where bone dies off), fracture nonunion (where a fractured bone doesn’t heal), and spondylolysis (a crack in the spine). Again, to treat these diseases, direct injection in the bone needs to occur and the needle must be placed precisely into the area of the issue once the MRI has been mapped to X-ray. There is no way to just give the patient an IV infusion or inject in the joint and have this work. The MRIs show that changes in the MRI and CT scan that indicate dead, dying, nonhealing, or cracked bone show that these areas have healed after a precise stem cell injection. Remarkably, all of these patients were surgical candidates and one was so far gone (the shoulder patient) that surgeons didn’t think there was a benefit in trying surgery. The upshot? We have many more images, but this smattering of films is a testament to how we have worked hard to document what we do. Again, be careful out there, as only a handful of providers have the skill to pull these results off. So Honestly --Can you do anything for Bone on Bone ? Would this help spinal stenosis? Does this work for the meniscus? What about a video showing before and after treatment for meniscus tears? Yes, we have seen evidence of meniscus healing. Have you ever used stem cells to treat a schmorls node?